Local First Vermont is a program of Vermont Businesses for Social Responsibility. Our mission is to preserve and enhance the economic, human, and natural vitality of Vermont communities by promoting the importance of purchasing from locally owned independent businesses. The Buy Local Coupon Book & Mobile App is the signature project of Local First Vermont. 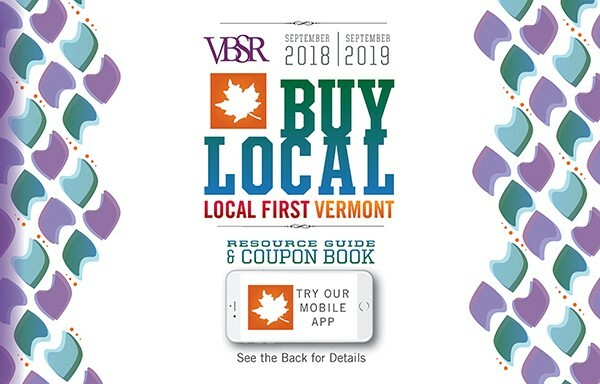 The 9th edition of the Buy Local Book was released on September 1st 2018 and includes over $3,000 in coupons to locally owned & independent Vermont businesses. The book also includes resource pages (free to access on the app) that highlight merchants and educate readers on the impact of buying locally. The books cost $20 and they are available for purchase at more than 50 retailers around the state as well as through a number of Vermont school fundraising campaigns. The mobile app is free to download through iTunes or Google Play, and $20 to activate all of the coupons. The coupons are valid from September 1 through August 31.